In keeping with yesterday's holiday, I just had to show this, because from the time of opening it, I laughed immediately and then pulled back in my own horror right after the fact. I can't even take credit for it. My friend Sal - the Sal in Philly, not the Cleveland one - sent it to me yesterday morning. I laughed and cringed a little bit with the pseudo-malaprop, and at the same time. 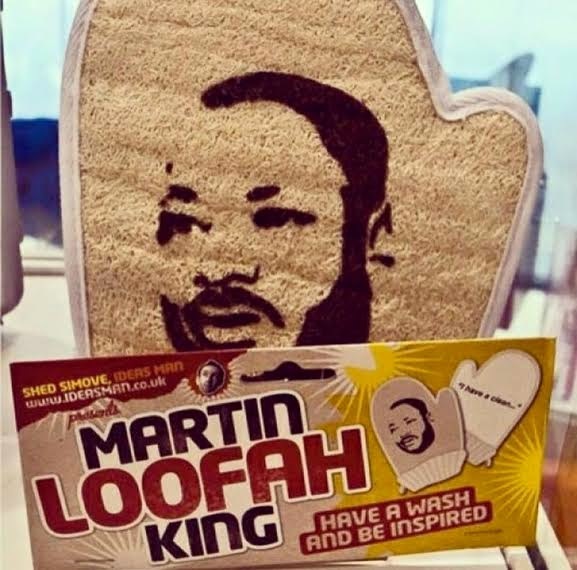 True, it is a loofah, but........well ya know......the language comes off a little racist. Maybe one of Martin's dreams was to exfoliate daily and have great skin! I mean, how do we know? And you know the marketers had dozens of slogans prepped that the King family would never let them use - not that this ever made it in front of his family to begin with. To be honest, I never Goooooogled to see if was a real item or not - nor am I doing so now. I'm sure one of you might. If it is real, I don't truly gets into someone to think this stuff up, let alone put forth the capital to produce, distribute and market such an item. Then you have to wonder about who the hell buys this stuff. I'll assume they are for white elephant presents - not so much to scrape dead skin cells off your body. But I've never really been able to understand your Average Joe - why should I start now? Why, it's none other than Shed Simove, Ideas man! WTeverlovinF? this is an insult to a great man! I saw an ad for an "I Have a Dream": breakfast at some cheesy cafe, but this really, really, takes the cake! I think this is hilarious and not at all racist. I may have giggled a little.